LG Electronics has released its new Multi V 5 variable refrigerant flow (VRF) solution in Abu Dhabi, UAE. The latest model in the Multi V range offers unmatched streamlined functionality by optimising energy efficiency and maximising user comfort, making it the ideal choice for new residential and commercial developments in the nation’s capital, said a statement. “This industry-leading system will make advanced climate control technology even more accessible, passing on excellent operational savings and greater comfort to our customers across the globe,” he said. LG has already supplied several projects of top-tier developers and government agencies with the latest climate control solutions, including Aldar, Musanada, Tourism Development and Investment Corporation (TDIC), CPC, Bloom, Al Qudra, ADCE and other renowned names in Abu Dhabi, it said. 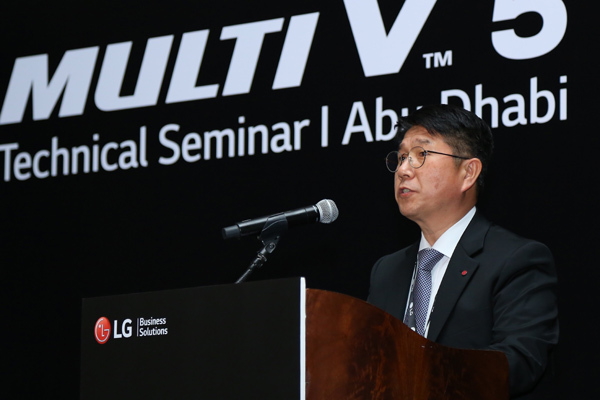 LG has also been a crucial partner with various government agencies, solidifying its position as a leader in providing comprehensive climate control solutions that meet Abu Dhabi’s stringent standards, it added. “Which is why QCC is proud to be a part of this launch with LG in recognition of the high-quality air-conditioning units they have made and continue to introduce to the region,” he said. The LG Multi V 5 is the only advanced VRF system in the market that is capable of offering exceptional performance even in the heat and humidity of the region. This fifth-generation air-conditioning system uses improved technologies that can meet new sustainability and energy-efficiency requirements of new real estate projects, and offer the most advanced climate control solutions without compromising on performance, efficiency and power-saving capabilities. The Multi V 5 is equipped with LG’s innovative and proprietary Dual Sensing Control and Ultimate inverter compressor, making the Multi V 5 a powerful climate control solution that excels in even the most strenuous conditions. The Multi V 5 is a superior way to heat and cool any space, with improved humidity control, individual set points per indoor unit, large outdoor capacity and quiet operation. It also allows for heating and cooling simultaneously in different zones, further enhancing energy savings and comfort. One of the most impressive features of LG’s Multi V 5 is its Dual Sensing Control which helps the air-conditioning unit evaluate climate conditions down to the smallest detail. Unlike conventional air-conditioners which only track temperature, it measures both temperature and humidity levels for outdoor and indoor environments. This comprehensive understanding of multiple climate conditions helps the solution determine its parameters in order to achieve optimal energy efficiency and maximum indoor comfort levels. The LG Multi V 5’s new Ultimate inverter compressor offers unrivalled efficiency, reliability and durability. Improving on the 15 to 150 Hz operational range of its predecessor, it operates from 10 Hz to 165 Hz. This widened range increases part load efficiency and enhances the Multi V 5’s ability to quickly reach the desired temperature and save more energy in the process. The Multi V 5 features an enhanced bearing system layered with PEEK (polyether ether ketone) – an advanced material normally used in airplane engines. In addition, its Smart Oil Management uses sensors to check the compressor’s oil balance in real time, minimizing unnecessary oil recovery operation. With an innovative biomimetic fan, four-sided heat exchanger, and improved compressor performance, the Multi V 5’s efficiency and capacity have each been enhanced, making it possible for a single outdoor unit (ODU) to reach 20 hp (with a maximum system capacity of 60 hp). Utilising research from the Seoul National University’s Department of Mechanical and Aerospace Engineering, the engineers behind the MULTI V 5 drew on inspiration from humpback whale flippers when designing the fan. Moreover, the solution’s advanced biomimetic fan significantly increases wind capacity.